Whether you’re an executive accountant, work in a factory or even a policeman, we all have one thing in common. The majority of us have had the same conversion at least once within the last 5 years. Now you’re thinking that I’m possibly just making things up. The conversation starts off something to this effect: “Do you remember the cartoon?” We look at classic cartoons. We all grew up watching our favourite cartoons on TV, planning our every move around the time they would be broadcast. The amount of time spent watching these cartoons seem to border on the insane, drawing pictures of characters such as He-Man, the sword from Thundercats, or the awesome cars from M.A.S.K. Now that I’ve got your attention, I will ask you the question: Do you remember any of these next cartoons? 101 Dalmatians, 2 Stupid Dogs, Action Force, Aladdin, Alvin and the Chipmunks, Animaniacs, Arthur, Astro Farm, Babar the Elephant, Banana Man, Batman, Battle of the Planets, Beetlejuice, Biker Mice from Mars, Bill Nye the Science Guy, Bionic Six, Bonkers, Brakenjan, Bravestarr, Bump in the Night, Calvin and Hobbes, Captain Planet, Care Bears, Casper and Friends, Centurions, Charlie Brown and Snoopy Show, Chip ‘n Dale Rescue Rangers, Conan the Barbarian, Creepy Crawlers, Danger Mouse, Darkwing Duck, Davie Crocket, Dennis the Menace, Denver the Last Dinosaur, Dino Riders, Dinosaucers, Doug, Double Dragon, Dr. Snuggles, Droopy, Ducktales, Earthworm Jim, Ewoks, Exosquad, Fang Face, Fantastic Four, Felix the Cat, Flash Gordon, Fraggle Rock, Freakazoid, G.I. 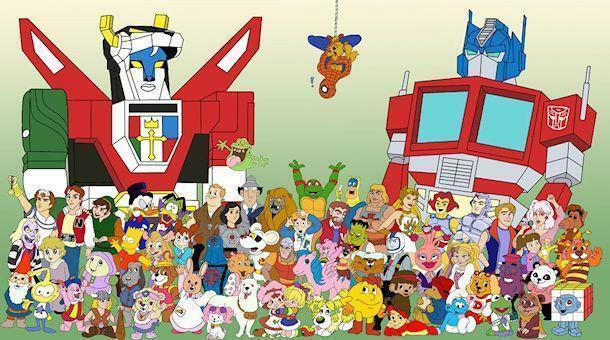 Joe, Galaxy Rangers, Garfield and Friends, Gargoyles, Get Along Gang, Ghostbusters, Gobots, Gooftroop, Goosebumps, Grady Greenspace, Gumby, Gummi Bears, Heathcliff, Heidi, He-Man, Hercules, House of Mouse, Huckleberry Hound, Hulk, Huxley Pig, Inspector Gadget, Jayce and the Wheeled Warriors, Jimbo and the Jet Set, Johnson and Friends, Kideo, Looney Tunes, M.A.S.K., Magilla Gorilla, Mario and Luigi, Marsupilami, Maya the Bee, Mega Man, Men in Black, Mightor, Mighty Man and Yuck, Mighty Max, Mighty Mouse, Mina Moo, Moemin, Monchichis, Monster Force, Mortal Kombat: Defenders of the Realm, Mr. Bogus, Mucha Lucha, Mummies Alive, My Little Pony, My Pet Monster, Nello en Patrasche, Once Upon a Time…Man, Paddington Bear, Panda Tao Tao, Paw Paw, Pebbles and Bamm-Bamm, Pinky and the Brain, Pirates of Dark Water, Pokel, Pole Position, Popeye, Popples, Pumpkin Patch, Punky Brewster, Quick Draw McGraw, Raggy Dolls, Rainbow Brite, Recess, Ricochet Rabbit, Ring Raiders, Robocop, Rocket Power, Ruff and Reddy, Saber Riders, Samurai Pizza Cats, Scooby-Doo, Secret Squirrel, Sharky and George, She-Ra Princess of Power, Shoe People, Silverhawks, Skybolt, Sonic the Hedgehog, Spiderman, Spiral Zone, Starchaser, Street Sharks, Super Campeones, Super Ted, Superman, Swamp Thing, Swat Kats, Talespin, Tasmanian Devil, Teddy Ruxpin, The Addams Family, The Adventures of Tin Tin, The Angry Beavers, The Animals of Farthing Wood, The Care Bears, The Family-Ness, The Flintstones, The Little Mermaid, The Jetsons, The Lone Ranger, The Magic Schoolbus, The Mask, The MuskerHounds (Brak en Jan), The Mysterious Cities of Gold, The New Adventures of Winnie the Pooh, The Pink Panther, The Poddington Peas, The Power Team, The Raccoons, The Rugrats, The Silver Surfer, The Smurfs, The Tick, The Tigersharks, The Wombles, The World of David the Gnome (Dawie die Kabouter), The Wuzzles, Thundercats, Timon and Pumbaa, Tiny Toon Adventures, Tom and Jerry, Top Cat, Transformers, Turbo Teen, Vicky the Viking, Voltron, Whacky Races, Where in the World is Carmen Sandiego, Where’s Wally, Widget the World Watcher, Wild C.A.T.S. Woody Woodpecker, Yogi Bear, and, finally, X-men. There are a number of others that I cannot recall, two of which really bug me. The first is a cartoon about a kid playing a video game of some sort then is transported into the game world. There are 3 characters; one is a Blue Big Foot 4×4 Truck, a tomato with green hair, and the hero with a sword. The second cartoon involves singing green mice, which have pointy alien ears. These mice sing opera most of the time. Although I have a separate list of my favourite cartoons to watch when I was a kid, I chose a top 5 list based on which of these cartoons had the best introduction or theme song. There are a few others that could have made the list but didn’t quite compare to the intros above. These included BraveStarr, TaleSpin, Marsupilami, Doug, Ducktales and Teenage Mutant Ninja Turtles, which complete my top 11 cartoon intros. I’m sure different introductions would have a lot more meaning to each individual, so again, if you wish to send us your favourite intros, please feel free to do so. You missed Robotech! Also these… Around the world in 80 days, Nils Holgersson, Vicky die Viking. Does anyone remember the Rescuers the movie? That, The Jungle Book & the animated Robin Hood typified my childhood. Didn’t have a favorite cartoon growing up, I watched everything. Typical 90’s kid. Hell I still remember the initial K.tv crew. Hell who remembers Scot Scott? Yeah. “Fievel Goes West” is also another classic movie. If you’re referring to the first KTV crew from the late 80s, then I still remember a few. Most of those KTV kids were in South African movies as well, unlike the later kids. Thanks for the comment, will add these to the list. Isn’t that the theme song he is singing? Don’t forget Voltron!! One of my favourites as a kid! Yeah, thanks for the link. I actually have this in my list of YouTube clips, but somehow overlooked it. If you listen to the announcers voice for Voltron its actually the voice actor who did Optimus Prime in the Transformers cartoons and in the movies. I actually found out which cartoon it is…I was referring to The Power Team. I’m currently looking for a cartoon that was showing late 80’s or 90’s. group of faeries/pixies/ little people living in tree/s and had flowers and leaves as hats. I wonder if you aren’t referring to The Magic of Herself the Elf? Hi, I’m looking for an animation I watched as a child maybe 20-25 years ago about the human body and it showed white blood cells as being alive and viruses attacking the body, with a guy with a long white beard. It played on whats now sabc 2?? Also i’m looking for an animation I just can’t seem to find anywhere on flowers that gave the characters in the animation powers, I think it had a alien-ish feel to it, also from around that time, I think both might of had a european influence. Thanks. Hi I remember the human body animated show. That was cool. It would play on Sunday afternoons I think. It was called Il Etait Une Fois. I dont remember the second show. Great compilation brother. I’m looking for the name of the cartoon I watched as a kid in 90s. It was a fishing competition to catch mysterious fishes. They had all these high tech fishing sticks. Been searching for an year now. I suppose I watched it along with digimon or bey blade or I may be wrong too. Please does anybody know this? I seem to recall another kids show I’m really keen to remember. It had an Aztec or Mayan setting and their were four kids with spirit animals and they fought against an evil guy (pretty sure he was summoning demons or something). The four kids went something like they were dressed according to their spirit animal colour. A guy in red who turned into a bull and became a rolling boulder- Taurus? And a chick in purple/blue? Who became an eagle or falcon or something…. I can’t seem to find it anywhere! Power Rangers oi remember the original one with zack as the black ranger. “Classics”, I think maybe not. ;) Haha. Hi, still remember Patrasche n Nelo? Cat147, think you are looking for “Die Bietjies”. I still have a episode on VHS. Does anyone know where i can get or view sandoekan die seerower , pokkel die eekhoring , niklaas die kind van vlare. The problem with most South African dubbed shows is that unless it was released on DVD or VHS to the public, there’s almost no chance to find it online. I think what you’re looking for is actually called “Raccoons”. :) Just do a search on Google, you can see their noses when viewing the images. What about fangface, tazz, and where’s wally. There’s a anime I’m looking for the past 12 or 15 years. it was on sabc 2 on a saturday afternoon when they used to show robocop and pokemon. The anime was about a young boy that stumbles upon a giant white robot that’s been dormant for years.When the robot senses the boy,it awakens and chooses him as it’s pilot.To access the robot he uses some sort of scroll.During the series the giant white robot fights two guardian like robots…one is blue dog and the other is a bird or something. I’ve asked fellow anime viewers and they can’t figure it out. There is a cartoon where some guy lived in a yellow place full of clouds or sheep and always had to go and save kids dreams that was bad. I cannot remember much more. Glow worms – which I think was split with another program to make the half hour slot. Ruud Dog. And the Dweebs. Hey. I also remember the one about the guy who saves the dreams. I was quite young but the sheep and clouds really stuck… I would love to know what show this was. I think this was Captain Zed and the Zee Zone. Rudolf take a look and see if this looks familiar? Rudolf. I think this was Captain Zee and the Zee Zone. Take a look and see if it’s familiar. Hi Rei, thank you so much. I have been looking so much to get hold of that TV show! Thanks again! hi guys can any of you list me any cartoons that used to play on SABC 2 which were about soccer, one of them the main character’s name was Phelezino. Bringing up a dead thread!! Can somebody cure my Mandela effect? I’m almost positive that the SABC I think tv2 had a children’s slot in the 90s called Mini TV?? Am I right? Or in another realm?? Pleeease prove me right!!! There was an alien puppet thing called Horatio Nd there was December holidays activities at like sun city and the like. I have such vivid memories but can’t find a single ounce of it anywhere…..
Secondly, I have good news for you, Mini TV was I thing, I remember the jingle. And, lastly, Horatio the “alien” was a character from The Nutshack cartoon…just Google it. The other stuff I’m a bit vague on, but there were some on-site locations for holiday programmes I do recall. Hi guys…does anyone remember a kids program called ‘Harry’s house?’ I think it’s South African made as there’s hardly any trace of it anywhere. Would love to know if anyone has it. If you’re talking about the show with the dress-up dog, Harry, then yes. I still have that song pop into my head randomly at times. I’ve been looking for a show that used to play on SABC 1 on Saturday mornings around the 2000’s. It was about space, there were factions and almost had a Star Wars/Mass Effect/Titan AE feel to it. There were a bunch of colonies of different species. The main character was human, the main bad character was some alien, in one of the episodes it tried to put out the sun with a giant ice comet. I’m stumped. Can’t for life of me think of anything. But then again, I wasn’t watching SABC around that time. Hi everyone! Maybe someone can help me, I’ve been looking for a cartoon shown in the 99s but could be from the 80s. I think it was an English cartoon (British) about an old man wearing brown plaid and he had a grey scottish terroir. Another one I’m looking for was on tv in the early 2000s set in a forest, with puppet animals. I don’t have much to go by. It was a live action sci-fi/fantasy about a young teenage boy who’s parents are murdered (?) and he’s taken in by some old crazy scientist (to a space station, I think) who tells him his family’s destiny was to protect some statue (?). Then a Darth Vader-esque villain attacks the station, kills the scientist (?) who, before dying, sends the fragments of the statue through portals to different planets. The rest of the series involved the youngster going to the different planets to reclaim the fragments and prevent the villain from acquiring them. Does this ring any bells to anybody?! I’ve searched all over the web and the best I’ve been able to find is one or two other people who remember the premise. Hi everyone. Hope you’re all good. I’m looking for a cartoon that played when I was probably 6 or 7 years old… so about 18 or 19 years ago. It revolved around 3 chicks who had staffs. The staffs had a moon on one, star on the other and a sun. When they used to activate their powers they would scream “Power of the Sun” etc. etc. They rode on horses. I don’t remember much else. It’s not Sailor Girls, or totally spies or anything that would just come to mind. I’m really struggling to find it. Please could you help me? My favorite show was Open sesame before they brought takalani sesame. Back in the eighties, there was a kid’s show on SABC about two elves, Engelbert and Emaline. They had a magic kettle that would steam whenever the naughty gnome, Norris Novango, was near! I seem to remember it was humans dressed in costume. The elves lived in a mushroom house. I have been looking for AGES and I cannot find anything on it. I know I did not imagine it! Please help?! This thread brings back memories. Does anyone remember a cartoon about a boy and a cat? Could have been Afrikaans Puss in Boots? I remember some of the theme lyrics actually: “Maar pasop! Hierdie kat maak dinge gebeur.” The cat’s master was calles Hans.